Barack Obama is no stranger to controversy – his whole presidential campaign revolved around that, if you remember. More so, this is not the first time that the President of the United States has showed deference to a leader of another country. Remember him bowing to the King of Saudi? Now THAT irked a lot of Americans. “This picture shows two things,” my friend writes. “1) The ‘right’ is wrong about Obama’s bow. 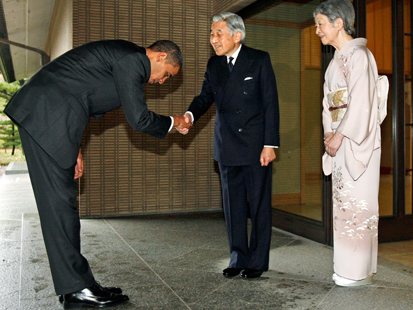 “2) The ‘left’ is wrong about Obama’s bow. “His bow is neither (1) unprecedented nor (2) a sign of cultural understanding. So what’s the difference between Obama’s bow and Nixon’s bow? The latter got it right – angle and all. Apparently, Obama’s angle was all wrong, and the addition of the hand shake was just NOT right. The overall effect? Kyodo News is running his appropriate and reciprocated nod and shake with the Empress, certainly to show the president as dignified, and not in the form of a first year English teacher trying to impress with Karate Kid-level knowledge of Japanese customs. The bow as he performed did not just display weakness in Red State terms, but evoked weakness in Japanese terms….The last thing the Japanese want or need is a weak looking American president and, again, in all ways, he unintentionally played that part. I wonder what Obama thinks about the buzz that he has once again generated? What do YOU think about it?